John Mueller from Google has recently stated that the link disavow tool had a little upgrade. The tool will now automatically flag potential issues upon file upload allowing webmasters to correct and re-upload the error-free file. Disavow tool update is discussed specifically at, 42 minutes. Updates, Revenue Goals & Link Building Obsession. Google’s head of search spam, Matt Cutts, released another video today named What are some misconceptions in the SEO industry? In short, Matt outlined three topics in this five-minute video. Panda & Penguin algorithms not about making Google more money in the short term. SEOs spend too much energy... on link building and only thinking about search engines. 4. 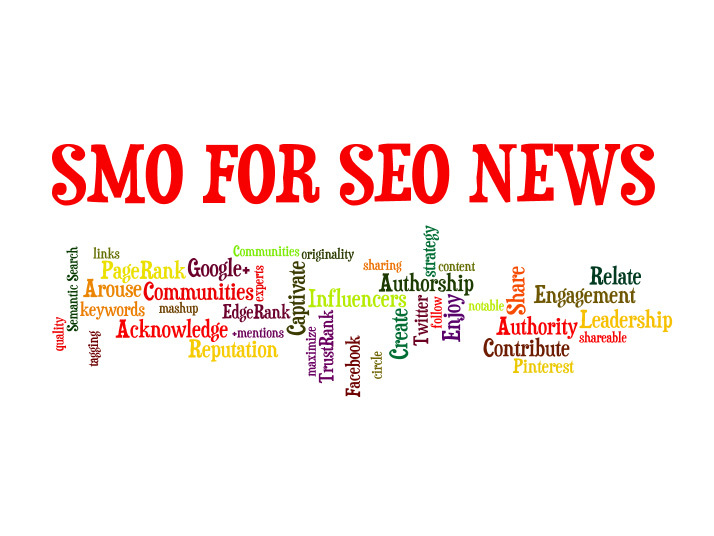 Social Media Optimization (SMO) for SEO. The Future of Search. ⓒ Captivate - Fun and interesting content, stand out from the noise. ⓓ Arouse - Arouse emotion, it is the one constant of all viral success. ⓕ Share - Seek shareable (quality) content, Reciprocate sharing with movers. ⓖ Acknowledge - Acknowledging encourages engagement, reciprocation. ⓗ Contribute - Find ways to contribute desired value, quality to audience. ⓘ Influencers - Identify key influencers (movers), to foster connections with. ⓙ Communities - Communities can expand your reach & effectiveness. ⓚ Reputation - Build personal reputation & brand, as a reliable source. ⓛ Engagement - Tag - Respond - Comment - Proactively seek to engage. ⓝ Leadership - Lead in social with new original ideas, be a Thought Leader. ⓞ Social - Be sociable, try to reach the individual person, visualize reader. ⑧ Authorship & Google+ is a royal romance, the marriage of Search & Social. Since its launch in 2011, Google Plus has been gradually moving towards being one of the most active social networks with hundreds of millions of people having active accounts. But what is Google+? And is it any different to any other social network? 6. Google+ Profile PageRank: The Real AuthorRank? Jun 11, 2013 by Mark Traphagen For SMX Advanced 2013. Everyone who uses Google Authorship wants to know: Is AuthorRank active yet? That is, is Google using Authorship data as a direct influence on search results yet? Most likely not. But...Authorship .. This is a fabulous slideshare by Mark Traphagen, with lots of great... well, I'll let him explain it when you watch it. Continue... Google+ Profile PageRank: The Real AuthorRank? Google is going to be reducing websites raking that are not properly serving smartphone search results, they're getting a little tired of all the errors and redirects. So if your site is not already smartphone friendly, it's something you need to seriously start planning for and working on. It's the way of the future! 8. Which should I use, rel=author or rel=publisher ? Should your site have an Authorship connection to Google+, a Publisher connection, or both? rel=author (Google Authorship) allows authors to establish a verified, two-way connection between their Google+ profiles and their content anywhere on the web. rel=publisher allows web sites (“publishers”) to create a verified connection between their official web sites and brand pages. Continue... Which should I use, rel=author or rel=publisher ? Google Apps for Business will help companies “discover a better way of working” through their cloud based services. If you have yet to experience Google Apps, it can make a tremendous difference to how you think about collaborative working. When I starting using Google Apps my online world changed forever. No longer did I need to ‘pass emails’ with attachments back and forth to people with whom I was working; instead, we could work together in the cloud, real time and even get virtually face-to-face in Google Hangouts. 10. What is Google Semantic Search? June 26, Book introduction David Amerland & Martin Shervington, Joshua Berg (guest). Google Semantic Search: Search Engine Optimization (SEO) Techniques That Get Your Company More Traffic, Increase Brand Impact, and Amplify Your Online Presence. Optimize Your Sites for Today’s Radically New Semantic Search. Breakthrough “semantic search” techniques are already transforming Google™’s search results. If you want to be found, yesterday’s SEO techniques won’t cut it anymore. Google Semantic Search tells you what to do instead—in plain English. David Amerland demystifies Knowledge Graph™, TrustRank™, AuthorityRank™, personalized and mobile search, social media activity, and much more. Drawing on deep knowledge of Google’s internal workings and newest patents, he also reveals the growing impact of social networks on your SEO performance. Whether you do it yourself or supervise an agency, this is your complete playbook for next-generation SEO! Coming out July, 15. Pre-order your copy from Amazon here & hurry cause they're going fast. Web 3.0 and Semantic Search is another interesting and related article by David Amerland. The web has changed and the world is changing with it. If you’re not feeling the quickening that comes with a sense of greater empowerment, right now, you are only a click or two away from the moment when you will. It’s inescapable. And the reason it’s inescapable lies in the fact that everything you do is data. Continue... What is Google Semantic Search? A Hangout On Air. 11. Does using stock photos have a negative effect on rankings? "Does using stock photos on your pages have a negative effect on rankings? Do original photos help you help you in this regard?" "To the best of my knowledge, the answer is, No. Do original photos help you? It doesn't really make a difference, whether it's a stock photo vs. an original photo. But that's a great suggestion... "
"To the best of my knowledge we don't use that directly in our algorithmic web ranking right now." Wow! Did Matt just say what he means, and mean what he says? I tell you, he has gotten a lot more frank in the last year, or so, maybe it has to do with knowing how much these algorithms are analyzed and tested, that a lot of people will figure these things out anyway. So getting a jump start on explaining it and why webmasters should make the right choices, can ultimately help the web and user experience more, whereas in the past a lot of visual clues & ranking factors were rather misleading in a negative way. Continue... Does using stock photos have a negative effect on rankings? The change is consistent with a message that Google’s been pushing recently, to focus people less on link building and more on building quality content. What are the top 3-5 SEO areas where webmasters make the most mistakes. 13. Will the Webmaster Tools API be updated for additional data? Can you tell us if Webmaster Tools will ever have an update to its API allowing us retrieve the "Search Queries" and "Backlinks" data? Matt Cutts: "The short answer is yes, we're working on it & hope to release it relatively soon. In the meantime, there are PHP & Python libraries that you can use to download the data. So we'll include a few links to allow you to get that data right now." Added here. Download the Search Queries data using Python. Download Webmaster Tools data using PHP (not an official Google project). Continue... Will the Webmaster Tools API be updated to add additional data? While this article is more about social media than SEO, it is very related to search ranking and I'm including it because it is very well done and has great graphics. Are you looking to tap into the power of Google+? Is your business leveraging all that Google+ has to offer? Have you created a personal profile or business page on Google+, but want more influence? Why Google+? #2: Make a Direct Connection Between Your Business Website & G+ Page. #4: Express Yourself With Bigger, Better Cover Photos. #5: Use Google+ as Your Business Page. #7: Join and Create Communities. Conversion paths, exits and other analytic metrics can be studied to determine if users were satisfied. Or, you could just ask them. Today, Google has released a tool that allows webmasters to query users directly — with one line of code required. Yesterday, MozCast, Moz's Google ranking volatility tool, reported the highest level of change in Google's search results in the history of MozCast. 113 degrees hot. Typically, on a normal day it will be in the high 60s or low 70s. Why the huge temperature? The other tools such as SERPs.com and SERP Metrics reported normal days for Tuesday. And more importantly, I didn't see any chatter in the SEO forums that would signal a Google search algorithm or ranking update. June 28, 2013 by Dan Petrovic & Toni Anicic. I learned how modern mass scale cloaking campaigns are made that are designed to dominate entire first page SERP of a keyword until busted. Of course, we’ll never use these black-hat techniques with our clients, but it’s good to know how it’s done to be able to notice it. I learned a lot more people use black-hat techniques than I thought, especially in Poland, and some of them are very proud of it. There are 3 fabulous sets of slides with this & if that's not good enough, they're also PDF's. Dan is obviously an excellent analyst & produces excellent visual material. 19. If I write about another article, where should I link original source? "I have a blog and I post original articles but I also like to link to the original website. So I link the website in a word in the first paragraph. Is this the right way or I should give a link separately at bottom." Matt Cutts: "Either way can work, it still flows PageRank either way & so credit will flow to the site you're referring to. For my personal preference though, I really appreciate when there's a link somewhere relatively close to the top of the article." "The thing I hate is, whenever you've got a regular news report... and they say, "blah, blah... and they don't link to the source. I mean, come on, link to your sources, whether you're a journalist, whether you're a blogger, let people go and look at the original information themselves." Did you hear that? Although Matt Cutts says this is not ranking advice, just asking everyone to be considerate & share credits & attributes. I think some people might actually be surprised by this, because with all this focus of removing links, some might have the idea that Google is really discouraging links. What he's actually saying is, when the linking is genuine and to original sources the link backs are encouraged and not discouraged. Continue... If I write about another article, where should I link to original source? Anyone in the SEO industry from the earliest days will remember with some fondness, the AltaVisa.com search site. So news of its final put to rest come with a tinge of a sigh and a moment of nostalgia for some of us. The Amazing AltaVista: You appeared on the search engine scene in December 1995. You made us go “woah” when you arrived. You did that by indexing around 20 million web pages, at a time when indexing 2 million web pages was considered to be big. This is one of those exceptional articles, that is definitely worth taking the time reading. The release of Google’s latest major algorithm update, Penguin 2.0, has ruffled the feathers of many professional bloggers and SEO experts. Cries have gone up across the Internet complaining of Google’s alleged attack on guest blogging. Guest blogging has such a successful method for increasing search engine rankings and blog traffic, it’s become a staple of proper SEO and content marketing practices. It bears the question, how could Google take away the primary tool of every good Whitehat SEO professional? The truth is Penguin 2.0 has done nothing to reduce the effectiveness of guest blogging. Guest blogging is as powerful a tool today as it was six months, a year or even two years ago. What has come under fire by Penguin 2.0 are guest blogging spammers who’ve either forgotten or never cared what it means to be a guest. Lots of important points here that I've been meaning to cover, everyone joining G+ should read. Have you noticed some people on Google+ doing the same annoying thing, over and over? For most, it's not on purpose. It's not their fault that they don't know any better. But the fact is, there's something they're expected to do, or expected not to do, and they're messing it up. Here are some of the most common mistakes people make on Google+, and what they should be doing differently. See if you can spot a few you recognize. Always Sharing Links Without Commentary. Sharing the Same Links to All Communities. Not Using a Profile Pic. Never Sharing Other People's Posts. Never Acknowledging Other People's Mentions. 23. PageRank Toolbar Update for June, 2013... NOT! The biggest news that did NOT happen, is the much anticipated PageRank Toolbar Update for June. In reality this can come at anytime and Google has knowingly made the updates somewhat irregular, so as to not encourage webmasters to focus on this, but to focus on the user experience instead. Humph! We'd never do that! I will also not be surprised if the rumors start swirling again that Google will no longer update the PR Toolbar as has happened in the past after longer delays. Yet, eventually the update happened & the fears were put to not. I also have a sneaking suspicion that this delay has to do with Google+ & how much of that PR will be showing quite clearly on the profiles, as I think it will. Does it have to do with a certain PageRank in Google+ series which brought an unusual amount of attention to this topic? Not impossible, but frankly I think it's more to do with the first. Here's a list of the last PR Toolbar Updates, so you can get an idea of the scheduling. Stay tuned to my profile and this site for this exciting update, cause when it happens for sure you'll be hearing about it from me. July 11, 2013 with Mark Traphagen & Joshua Berg, hosted by Yifat Cohen. Next week Mark Traphagen and I have been invited to what's sure to be an interesting and informative hangout with Yifat Cohen. So you'll want to watch her profile for details on that event coming out. With all of the following amazing speakers: Martin Shervington, Joshua Berg, Mark Traphagen, Ronnie Bincer, Hilah Johnson, Ryan Hanley, Chris C. Ducker, Autumn Giles, Stephanie Manley, Joanne Ozug, Adam V. Barnes, Sally Ekus, Kita Roberts, Valerie R. Coffman and more to come! One of the dreams that I’ve had over the last few years I’ve been blogging was to hold my own Bloggers Conference. Last December Google helped me move closer to achieving that goal, by adding communities to an already robust platform... Two months ago I began thinking about holding a Virtual Food Bloggers Conference... I began reaching out to many of “The Superstars of G+” to get their help with this project, and to my surprise almost everyone said yes. I'll post updates on this event on my profile here. If you've had to redirect content on your site, or need to move links & pages, you'll need this. Have you ever redirected a page hoping to see a boost in rankings, but nothing happened? Or worse, traffic actually went down? When done right, 301 redirects have awesome power to clean up messy architecture, solve outdated content problems and improve user experience — all while preserving link equity and your ranking power. When done wrong, the results can be disastrous. Continue... The Evolution of Search. Don't know how I missed this one, but no social media, or even search optimization would be complete without the most useful tool of all, video and now especially, Google+ Hangouts and YouTube. June's LIVE YouTube Training is focused on the topic of video optimization, including writing good metadata, optimizing your channel experience, your videos, and more. 1. We kick off the evening with some optimization training from our hosts (see below). 2. Live Q&A about optimization, SEO, online video, YouTube, channels, and such. 3. A look at a few of your channels, offer feedback and advice for how to improve and highlight what you're doing well. Berita terbaru dan terkini dari agen bola City Holiday - Kabar baik untuk Manchester City terkait perkembangan kondisi Yaya Toure. agen bola City Holiday Terpercaya – Yaya Toure yang kian membaik dan disebut sudah siap bermain melawan Crystal Palace akhir pekan ini. Pemain internasional Pantai Gading itu diperkirakan sudah bisa main saat Citizens tandang ke Selhurst Park melawan Palace, Minggu 27 April besok. "Soal Yaya, saya pikir dia sudah bisa bermain lagi di laga selanjutnya (kontra Crystal Palace)," tutur manajer City Manuel Pellegrini seperti dilansir Soccernet. Yaya begitu penting perannya musim ini dengan menjadi topskorer tim di liga dengan 18 gol, hanya kalah dari Luis Suarez dan Daniel Sturridge yang total sudah bikin 50 gol untuk The Reds. Berita terbaru dan terkini dari agen bola City Holiday – Meski tampil amat dominan Atletico Madrid hanya meraih hasil 0-0 kala melawan Chelsea di leg pertama babak semifinal. agen bola City Holiday Terpercaya – Atletico juga agresif dalam menyerang dengan melepaskan 29 tembakan dengan 12 di antaranya yang mengarah ke gawang. Akan tetapi Hasil ini menghentikan produktivitas Atletico dalam mencetak gol di Liga Champions. Atletico pun dibuat buntu oleh Chelsea. Menurut catatan Opta, ini adalah kali pertama Atletico gagal mencetak gol di Liga Champions musim ini. Kendati demikian, Atletico masih mempertahankan catatan tak terkalahkannya di Liga Champions musim ini. Mereka membukukan delapan kemenangan dan tiga hasil imbang dalam 11 pertandingan. Laga leg kedua akan dimainkan di Stamford Bridge pada 30 April mendatang. Berita terbaru dan terkini dari agen bola City Holiday – Menyusul diberhentikannya David Moyes sebagai manajer, Steve Round dan Jimmy Lumsden juga ikut didepak dari Manchester United. agen bola City Holiday Terpercaya - Keduanya adalah staf yang dibawa Moyes ketika dia ditunjuk menjadi manajer United pada musim panas tahun lalu. Sky Sports mengabarkan bahwa keduanya setuju untuk berpisah dengan United usai menerima beberapa kesepakatan. Moyes dipecat beberapa hari setelah United kalah 0-2 dari mantan klubnya, Everton. Musim ini, United sudah menelan 11 kekalahan dan Keluarga Glazer dikabarkan sudah tidak bisa bersabar lagi dengannya. Ryan Giggs pun ditunjuk sebagai manajer interim sampai United menunjuk manajer berikutnya. Agen Bola Terpercaya Cityholidaybet Reported - Massimiliano Allegri carries a high confidence before the duel between Juventus and Atletico Madrid, and believes that his team's top ranking in Group A of the Champions League. If you Bianconeri able to avoid defeat, was nice enough to seal a place in the Round of 16, regardless of whatever the results that have been achieved Olympiakos, which is only three points behind. However, despite the fact that the new package is less satisfactory results when held 0-0 by Fiorentina, Allegri optimistic and his team should be able to bypass the elected Polish Diego Simeone. Agen Bola Terpercaya Cityholidaybet Reported - Sports possible without the use of the service wing on loan from Manchester United, Nani, in the final of the UEFA Champions’ League group stage after anti-Chelsea player suffered a thigh injury against Boavista, on Friday (5/12). Portuguese international limped off to be replaced by Andre Carrillo in 31 minutes after the injury in the right thigh during a performance at the Estádio do Bessa artificial turf. Pressure Nani long to fit in the battle Krusia at Stamford Bridge on Wednesday with Portugal team needed points against the forces of Jose Mourinho to ensure a place in the Round of 16, and convert Schalke. Nani in the best performance in the Champions League this season, at the beginning of the five games and incised four goals, including the wonderful work Versys Maribor in the fifth round. Agen Bola Terpercaya Cityholidaybet Reported - Persib Bandung plan to land winger Bali Pusam United Bayu Slot certainly fail. It was after the relevant chose to stay with the club coach of the Sjafri Indra. Djadjang Nurdjaman Arsenal coach also asked fans to be patient, and chose to focus with the squad that has dimliki Maung Bandung today. Djanur said "We will focus on the players who are currently communicating with us and of course preparing the players who have joined." Besides Bayu, Arsenal also had the wing's aim Pelita Bandung Raya, David Laly. But the same money with Bayu, David also chose to remain in uniform The Boys Are Back for Indonesia Super League next season. Agen Bola Terpercaya Cityholidaybet Reported - Aston Villa boss Paul Lambert said he would make every effort for the sake hook permanently Tom Cleverley of Manchester United in January. 25-year-old midfielder was undergoing a loan period at Villa Park, but the latest news mentions Lambert intend to bid £ 7.5 million for the sake of making it last longer. Lambert said "I had the option to buy in January, but I probably would still continue lending period until the end of the season prior notice. The plan makes permanent status depends on the excellence club. For sure I will negotiate with Tom because he is still a Manchester United player. " Agen Bola Terpercaya Cityholidaybet Reported - Former England star Gary Lineker claims Harry Kane has the potential to become the best striker of all time Tottenham Hotspur. Kane successfully penetrate the main squad this season with the Spurs aside Emmanuel Adebayor and Roberto Soldado, respond to it Lineker believes the 21 years it will continue to evolve. "He could be the most successful striker for Tottenham and England as well as possible," he told the Evening Standard. "Kane is very good in a duel air ball, has good touch, and also smart enough to able to fool an opponent through the trick." "If the speed is capable of being upgraded, you will agree it is a complete player. It is not easy for young talent to compete and I am glad he had the chance."